He is seen here in his Milwaukee Braves uniform. LEFT HANDED VARIATION. The card looks great and is in. All cards are in LIKE NEW(MT-NM) condition and you will receive the card in the picture. HANK AARON. Photo Variation. Series One. Super Short Print. New Listing2019 Topps Evolution Of #EO-2 Team Logos/Uniforms Hank Aaron Ronald Acuna Jr.
2019 Topps Evolution Of #EO-2 Team Logos/Uniforms Hank Aaron Ronald Acuna Jr.. Condition is Like New. Shipped with USPS First Class Package. THESE CARDS WHERE ONLY ON SALE FOR ONLY 1 WEEK AND THEN THEY WHERE PRODUCED, NO MORE CARDS WILL BE MADE. SO THIS IS A LIMITED EDITION CARD OF THESE PLAYER. 150 Years of Baseball subjects include. The grading listed is our opinion and we are not professional graders, however, we do our best to represent the cards to the best of our ability. This is a very nice card of the HOF legend! Get this now while you can! 2018 Topps Tribute #50 Hank Aaron Atlanta Braves Baseball Card. Condition is Like New. Shipped with USPS First Class Package. The card is NM/Mt-Mint condition. Any scan that appears to be out of focus is the scanner & not the card. This is No. 1,594 of 10,000 limited production. 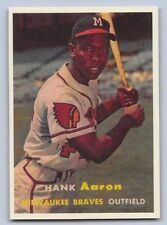 2018 Topps Series 1 Hank Aaron 35th Anniversary SP Card #83-2 Braves. 2018 Topps Series 1 Hank Aaron 35th Anniversary SP Card #83-2 Braves.. Condition is Like New. Shipped with USPS First Class Package. Serial numbered 23/49, oversized card. 1989 Topps Baseball #663 Hank Aaron JSA Authenticated Autographed Card !!! #663 Hank Aaron JSA Authenticated Autographed Card ! PLAYER : Hank Aaron. YEAR : 1996. winner also will get 5 cards as bonus (include random insert card, normal cards, finest, bowman,etc). 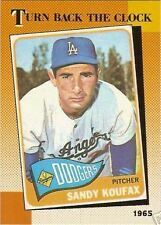 319 SANDY KOUFAX - Brooklyn Dodgers. 310 PEDRO MARTINEZ- Boston Red Sox. 318 TY COBB - Detroit Tigers. 311 HANK AARON - Atlanta Braves. TOUGH TO FIND ! Great lot for those trying to build the 20 card Short Print Set ! 2018 Topps Museum Collection Copper #47 Hank Aaron Atlanta Braves Baseball Card. Condition is Like New. Shipped with USPS First Class Package. New Listing2001 Hank Aaron Upper Deck Hall of Famers BAT Card #B-HA! 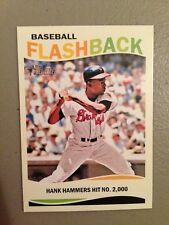 2001 Hank Aaron Upper Deck Hall of Famers BAT Card #B-HA!. Condition is Like New. Shipped with USPS First Class Package. Hank Aaron 4 Card Lot. Assorted Legacy Cards. Atlanta Braves. 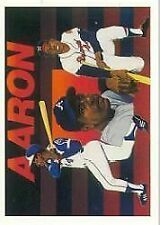 1986 Donruss Highlights Hank Aaron Atlanta Braves Puzzle. 2001 Topps ATLANTA BRAVES Complete Team Set 29 JONES, HANK AARON Sharp LOOK !